Q: Is Michelle Obama left handed? 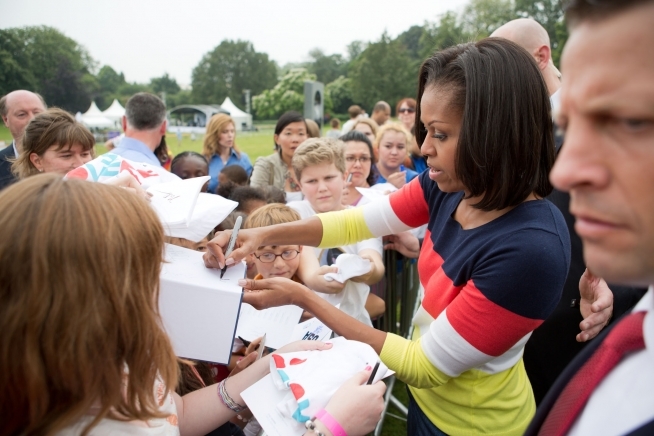 No, Michelle Obama is not left handed. She is definitely ambidextrous though, curling 35lb dumbbells in each hand with ease. No one was more upset about Lance Armstrong’s confession of drug use than the First Lady. She was in the middle of chatting up the gorgeous Princess of Yordania, comparing workout regimes when an aid delivered the news. A distressed Michelle excused herself and was found doing her favorite Insanity 2 routine while blasting Destiny’s Child’s Survivor. was born during a 1964 Olympic trial when her competing mother didn’t realize she was pregnant and attempted to squat 350lbs. She went on to win Silver during the games. Michelle has said her mother was the main catalyst for her weight-conscious and healthy lifestyle. Her father was inspirational in helping with educational activities, and paying for everything. Princeton and Harvard ain’t cheap. Having a flare for style, and body that just won’t quit, Michelle has been spotted wearing fabulous dresses by designers like Jason Wu and Nicolas Cage’s son Weston.